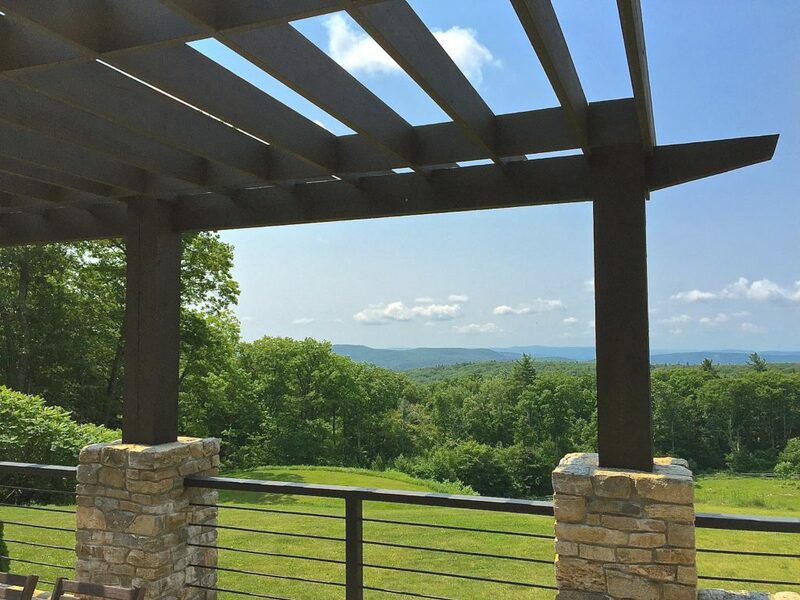 A well-placed pergola can frame a view and soften the transition from indoors to outdoors. 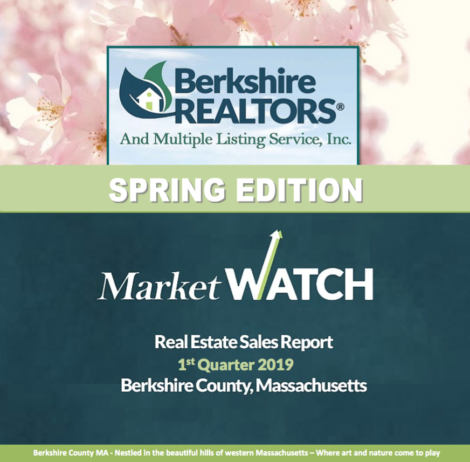 Life in the Berkshires is driven by the seasons. 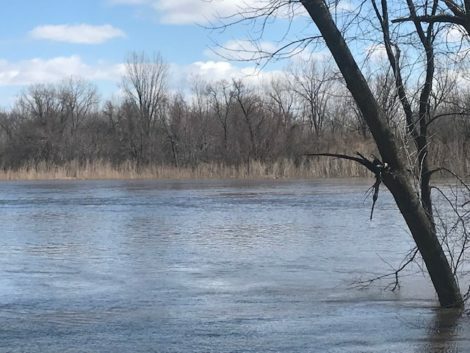 After a long winter, when spring finally arrives, we stick our heads outside like Punxsatawney Phil to see if it’s safe to venture out. 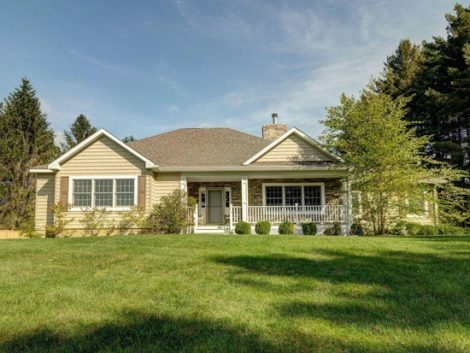 We leave our sheltered habitat and regard the miracle of greening lawns, spring blossoms and budding trees. We plant gardens and plan to spend as much time outdoors as we can. It’s entertainment season. Far-flung family arrives. Guests pop in for the weekend and our tight-knit group of winter warriors grows. Fair weather suddenly means more entertaining and more space is needed to enjoy it. But adding on to your home can be both expensive and unnecessary if your needs truly are seasonal. 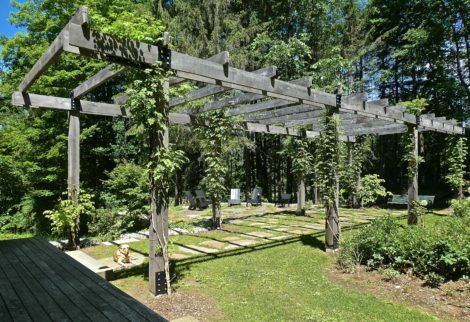 One stellar option might be to add a pergola, a cost-effective way to gain shaded, summer living space without the need to heat or maintain it off-season. A pergola is an open air structure, usually made with posts of wood, stone or metal. Cross beams tie the posts together into an exposed frame, and a sturdy lattice caps it off. Rectangular in form, pergolas tend to resemble a covered walkway or path. 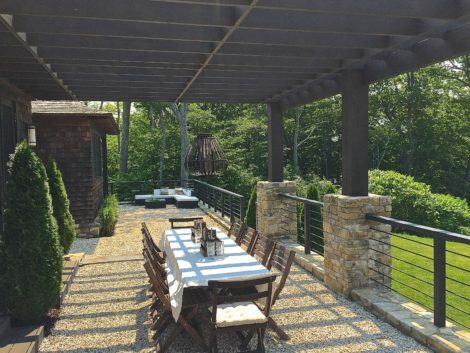 Though typically not fully roofed, like an arbor or gazebo, a well-positioned structure can provide shade in the heat of summer, both for the space it creates and for your home, keeping it cooler. Pergolas are often covered in dense woody vines that add to its lushness and cooling effects. If attached directly to a structure, perhaps at south-facing french doors over an existing terrace, they extend indoor living space outward, creating a transitional space to the gardens. Pergolas date back to at least the 1600’s, but fell out of favor in the 18th and 19th centuries as a more naturalistic style of gardening became the fashion. Famous landscape designers like Lutyens and Jekyll returned the pergola to popularity in the 19th and early 20th centuries and rarely is there a summery space more romantic than a lushly planted pergola. There is a pergola style for nearly every architectural style. By its very nature, a pergola is a very honest structure. You can see its connections, its detailing and, if designed correctly, it can add the perfect outdoor room to nearly every home. As the famous architect Mies van der Rohe said, “God is in the details.” Painted white and topped with perlins that have a curvaceous tail shape, a pergola compliments a turn-of-the-century estate home. Tapered columns and exaggerated angles on the cross pieces are perfect for Craftsman or Shingle-style homes. 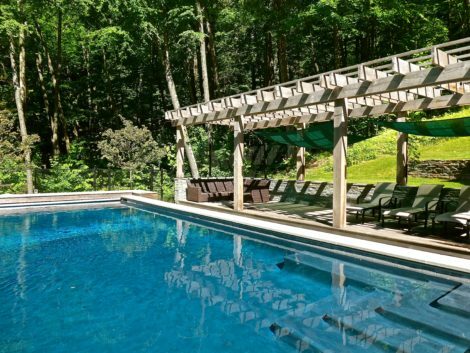 Stone piers and rough-cut timbers, covered in wisteria or grapes, create a grotto-like feel next to a stream or pool, whereas square cuts and cleaner lines, perhaps with exposed fasteners, compliment a more modern home. This radically cool industrially-inspired home in Lenox (above and below) had a huge back yard that was completely unused. 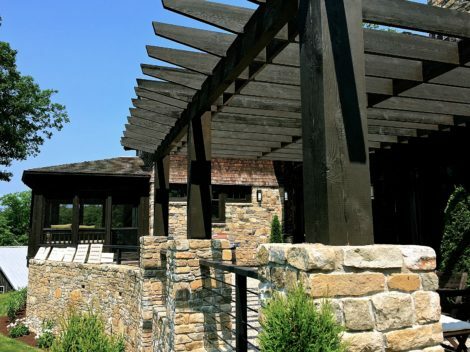 By adding a 50’ long locust pergola and re-terracing the grounds with gabions, the family now feels connected to their outdoor space and use it daily. 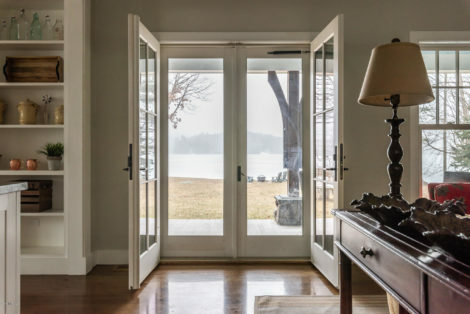 Placement was key, and we added huge sliding glass doors that opened up a new axis for the home, bringing more light and distant views into the heart of the home. This Lenox home, shown in the four following photos, had the largest south-facing roof deck I’ve ever seen on a private home. Unfortunately, it baked in the sun and became unusable for most of the day. 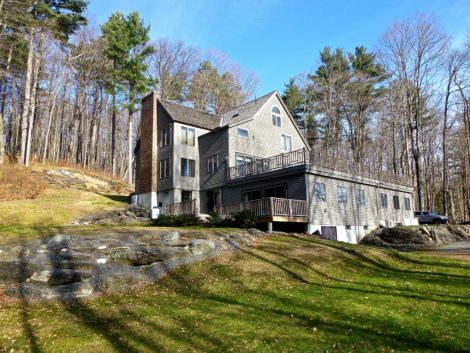 The “before” shot (below) illustrates how the massive roof deck and siting kept the house from feeling connected to the land. The renovations more than doubled the usable areas of the home without adding any four-season costs and complications. The house before renovation, with its unsheltered deck. Photo: Ritch Holben. The renovation was done in two phases. In the first phase, I added a huge three-season porch off the dining room and then wrapped the remaining roof terrace with an L-shaped pergola, accentuated with a pavilion roof at the corner. This pergola (below), part of the phase 1 renovation of the project above, is actually a pre-fabricated kit system, made of fiberglass to minimize maintenance. It also provides all concealed fasteners for a cleaner look. A cedar-clad pavilion hip roof sits on the corner, providing a destination with full shade and rain protection. 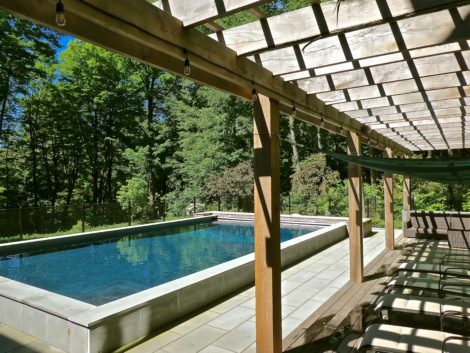 The second phase of this renovation included the addition of a new pool and a 40’ long wood pergola raised 6” above the stone pavers with a Thermory deck. The addition of commercial-grade string lighting adds a magical touch at twilight. 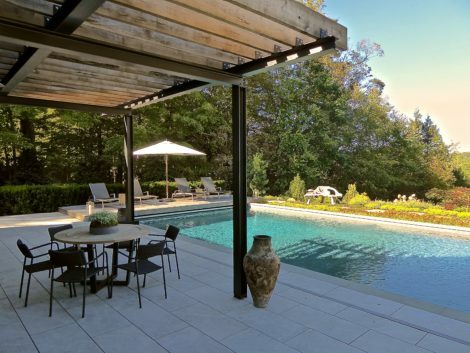 Today, pergolas have been bitten by the technology bug, like everything else, and sleek mechanized structures can now be purchased with steel frames and retractable louvers or motorized fabric shades. While custom or technologically-advanced pergolas can be costly, there are budget-conscious options. For example, Target currently sells a very handsome 8’ x 8’ pergola structure with a retractable roman shade fabric top for under $400. Pergola kits are available in fiberglass, composites or vinyl to reduce maintenance, should that match your lifestyle, but for true quality, a custom-built solution using naturally rot-resistant woods like cedar or locust woods, stone and steel will always hold greater appeal, at least to this writer. 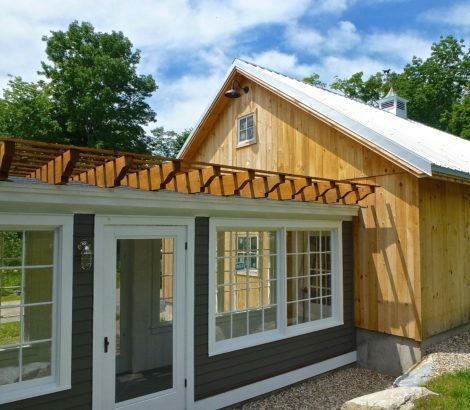 This Alford project (above) needed a year-round protected connector to a new barn addition. Although a pergola was the right choice aesthetically, it wasn’t practical. The solution was to build a traditional low-pitched asphalt roof, then add shaped rafters and cross-pieces that would add the shadows and character of a pergola without the snowy feet. 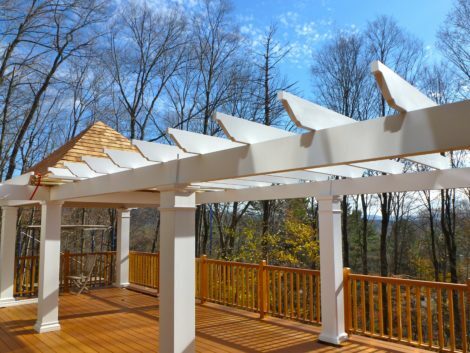 Pergolas often link two structures together, like the house to a barn or outbuilding. They can be free-standing, placed to create a destination, block an unsightly view or provide structure for a hammock or outdoor dining. If you’re lucky enough to have a pool, a pergola on a terrace gives a shady spot for repose when the August sun gets to be too much. Pergolas may not require a building permit, (unless over 200 square feet or attached directly to a structure), but always check with your local building inspector just to make sure. And as the size, orientation and style of a pergola can be as varied as a home, it’s always a good idea to consult with a design professional to be sure that your pergola will add all it can to your summer enjoyment. These are masterful! We are ridiculously lucky to have such a talented person as Ritch Holben right here in our own backyards, (under a pergola, perhaps?). Bravo, Ritch! Thank you, Maria, for those kind words. I do love what I do, be it in the house, or out the house! lol… and I wouldn’t be doing it in the Berkshires if not for you, so I owe it all to you. RITCH, not only are your designs incredible, thoughtful, and enduring, you are a damn fine writer! More! Please…. Beautiful photos and beautifully written! Inspiring, to say the least.